Cheeseburger soup is a wonderful way to enjoy all of the flavors of your favorite cheeseburger in a bowl. 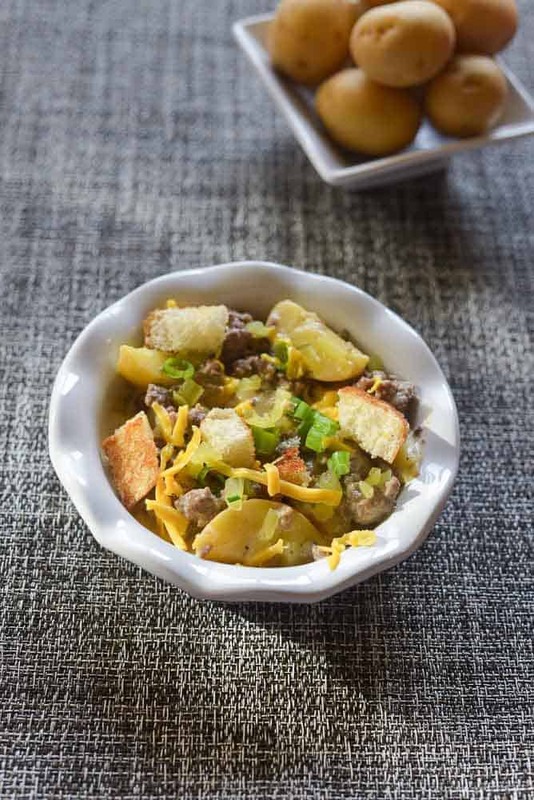 I know we are always looking for a new way to use ground beef, but when combined with the buttery gold potatoes from Tasteful Selections you are going to wonder why you didn’t think of this idea sooner. Are you ever looking for a good hearty soup? I know I love a soup that can stand on its own when served as the main attraction. This cheeseburger soup will do the trick. Filled with everything you love in a cheeseburger. I have ground beef, cheese, onions, bacon, cheese and more. We also add some of the Tasteful Selections gold potatoes in here to add flavor. This soup was so good our tasters gobbled this one up quickly. Oh yes, we even garnish this soup with toasted hamburger buns and dill pickle relish. 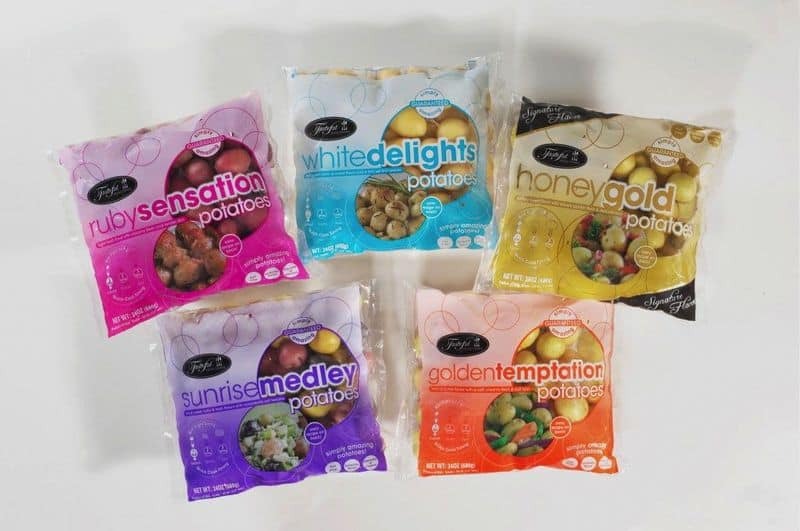 These potatoes are grown by family farmers who grow potatoes for today’s busy lifestyle. With small sizes and special flavors, each variety has been tested to assure that it meets the highest standards for quality, taste, and texture. Yes! You can make cheeseburger soup! Sprinkle flour over the onions and cook for about 1 minute or until the flour becomes fragrant it should smell like pie dough. Begin to make a roux by adding about 1/2 cup of chicken stock into the pot, stir until the mixture thickens. Add in another 1/2 cup of stock, and stir in until this thickens, then add the remaining 1 cup of stock and stir until the mixture thickens. Add potatoes to the soup mixture, cook for about 15 minutes. Then add ground beef, cheese, dry mustard, and Worcestershire sauce and stir until well blended, and the soup is heated through. While the soup is heating, cut a hamburger bun into 1/2 inch cubes. Toast the bread cubes in a small skillet with 2 teaspoons of butter until they have browned. Stir occasionally, so the bread does not burn. Serve the soup by pouring into bowls and garnishing with toasted hamburger buns, dill pickle relish, crumbed bacon, green onions, and sprinkling with some additional grated cheese. Let me know how you enjoyed it. I love soups like this – perfect for cold winter days! I know what you mean, some days are perfect for a cool winter day. My very favorite soup is french onion soup! Your cheeseburger soup looks delicious! I love the addition of potatoes too. I’ve been on a soup kick lately. I’ll be giving this a try! I love french onion soup too! good clam chowder. I wish I could get it nice and thick like the restaurants do but don’t know how. Maybe they use Guar Gum?? Guar gum is fully unnecessary. Make a roux, it’s crazy easy and one of the the needed items to make some of the mother sauces. If you don’t know what mother sauces are, learn. You can make almost any good food knowing your mother sauces. A white sauce will allow you to make dozens upon dozens of meals, everything from any thick cream sauce to almost any cheese sauce. There’s nothing like broccoli with cheddar sauce. In fact, your mother sauces, if you don’t learn them, you might want to give up cooking all together. I’m not exaggerating. If you’re going to buy any cook book, start with any Better Homes and Gardens and they’ll have all those sauces covered. All the fancy chef books can wait, Racheal, Alton and Cat Cora will understand, they’d rather you learn the very basics before trying to tackle what they do.